Veer west off Interstate 57 in south central Illinois and you’ll be smack dab in the heart of Amish Country, Arthur, Illinois. “You’re a stranger only once,” is the town’s motto and it sets the tone for a warm and welcoming visit. Book a room at Marsha’s Bed and Breakfast there and you’ll have a comfortable and convenient home base for exploring the area. Arthur’s Amish community was settled in 1865 and has grown to more than 4, 500 members living in the surrounding countryside. Pristine farms dot the land, and wide shoulders on the roads allow for the vibrant buggy traffic. Just a few hours south of bustling Chicago, this is the place to come for peace and quiet, along with some great shopping and hearty eating. Drive through the countryside and you’ll see horses working the fields and homes that seem straight out of a storybook. Scattered here and there on country roads are produce stands, butcher shops, and other Amish stores selling an assortment of foods, many locally made. Stop into downtown Arthur and you’ll find more shops selling handcrafted Amish furniture and quilts, as well as other gift items. 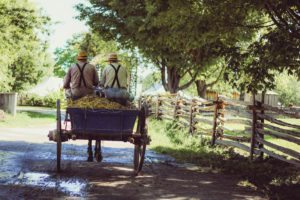 One of the best ways to experience the Illinois Amish community is to sign up for an ACM Tour, where you can learn about the Amish history and lifestyle, visit individual shops and, best of all, enjoy a home-cooked dinner in an Amish home. After an easy-going day of touring, enjoy an equally relaxing night at Marsha’s Vineyard Bed and Breakfast. The charming salt-box cottage has two spacious suites with private baths, a pretty garden, and a patio where you can settle into a glider and watch the evening sunset. Martha’s Vineyard Bed and Breakfast is a member of the Illinois Bed and Breakfast Association… a unique lodging experience! This entry was posted in Illinois Bed and Breakfasts, Local attractions, Touring Illinois and tagged Amish, Illinois B&B's, shopping by admin. Bookmark the permalink.